Although I’ve titled this blogpost “New kid on the block”, I can’t pretend that I’m that new, having been in the privileged position of Head of Business for Scotland’s Futures Forum since October last year Since being appointed, however, I’ve spent a lot of the time getting my head round all the great work that the Forum has done in the past, and all it could do in the future, so that it’s only now I feel able to write a blog about the Forum’s future. My predecessor, Donald Jarvie, left an organisation in rude health, with great networks and a wealth of material to draw on. He also left near the start of a parliamentary session, with a new Presiding Officer as chair of the Forum’s board of directors. Ultimately, 2016 saw a relatively large turnover in our board membership, along with the many other political developments you’ll be familiar with. With these new circumstances, the job for the Forum’s board of directors has been to clarify the focus of the Forum’s role and the activities to carry out in the coming years, with my job being to support those considerations and implement what they decide. I won’t go into details yet, partly as there are decisions still to take, but I think it’s clear that the directors are keen to make the Forum a resource for Scotland and its Parliament and parliamentarians. This means keeping an eye on what might be coming up and looking for ways to support parliamentary committees and others to consider the long-term trends or issues involved in the decisions being taken today. 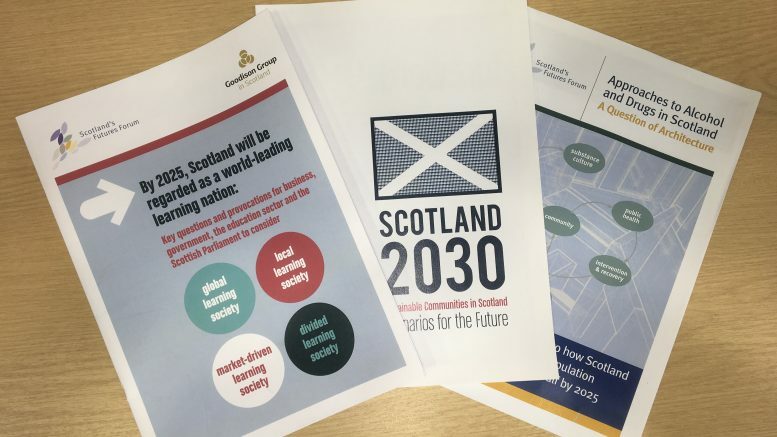 The Forum is also planning a deliberately aspirational programme on Scotland in 2030, which you can find out more about on our Scotland 2030 Programme page. Again, the full details are to be developed but we’re looking to consider different aspects of Scotland’s society and culture and how they might develop over the coming 15 or so years. In doing this work, we’ll be conscious of the great work the Forum has done in its history, providing a futures and positive view of ageing, mapping ways to reduce damage from alcohol and drugs, and envisioning Scotland as a world-leading learning nation – to name but three. The lessons from this work will inform our way forward. Another new development is this blog, which I’m hoping will be a new way to share thoughts and reflections on the Forum’s work. Also published today is a blog from Eleanore Widger, one of the current Futures Forum fellows, who has been working on the thorny and fascinating question “What is a civilized nation?” By looking to the past, the aim is to envisage a bright future – pretty much what I’ve been doing over these past months. There’s no comments facility here but please feel free to drop me a line with any thoughts on this blog or the Forum’s work – We’re on ScotlandsFuturesForum@parliament.scot and @ScotFutures on Twitter. Look forward to hearing from you!